After a long weekend in Münster and Düsseldorf, Germany, where Hefeweizen and Altbier were enjoyed in some significant quantities, we arrived home with a couple hours left on the sun-trap terrace. Just enough time to open a bottle of La Trappe Blond. 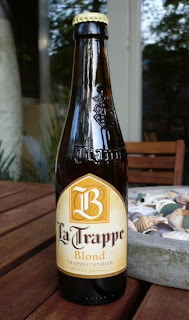 In previous tastings, I wasn’t overly impressed with La Trappe Dubbel or La Trappe Quadrupel, and in general, I have to say this brand, La Trappe from the Koningshoeven Brewery, is my least favourite Trappist label. And I’m not just saying that because it’s from the Netherlands while this is a blog about Belgian beer. The Blond again failed to meet expectations. It pours a lovely clear amber, but I could hardly find anything in the taste to distinguish it. Not that it’s bad by any means -- it does have a creamy sweetness that’s identifiable if not exactly noteworthy. But really, if that’s the best I can say about it, it must be pretty disappointing. 6.5% alcohol, in case you were wondering. Special thanks to Marcus for introducing me to Alt on Saturday!